A petition to proclaim February 10 "Cliff Burton Day" in Castro Valley, California in honor of the late METALLICA bassist has tallied more than two thousand signatures as of Wednesday. "I think it's a good idea as well. I would support it," Mike Crawford, MAC Board Member, told KGO-TV. The MAC Board voted 7-0 in favor of creating a "Cliff Burton Day." Their vote forwards the resolution on to the Alameda County Board of Supervisors. Their meeting will be on February 6. Born in Castro Valley on February 10, 1962, Burton's life was tragically cut short in a tour bus crash on September 27, 1986 12 miles north of Ljungby, Sweden. He was just 24. The intro to the METALLICA song "Damage, Inc." was written and performed by Burton. "It's about eight or 12 tracks of bass, a lot of harmonies and volume swells and effects and stuff," he explained. 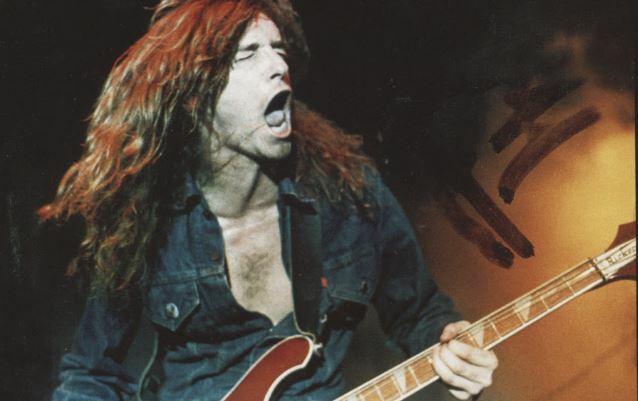 Cliff had nine other METALLICA writing credits: "Anesthesia (Pulling Teeth)", "Fight Fire With Fire", "Ride The Lightning", "For Whom The Bell Tolls", "Fade To Black", "Creeping Death", "The Call Of Ktulu", "Master Of Puppets" and "Orion". He was credited posthumously on the "...And Justice For All" track "To Live Is To Die". Burton's huge talent and achievements were chronicled in book form with the 2009 global publication of "To Live Is To Die: The Life And Death Of Metallica's Cliff Burton", written by U.K.-based author Joel McIver and published by Jawbone Press. The foreword was provided by METALLICA guitarist Kirk Hammett. In a 2016 interview with TeamRock, METALLICA frontman James Hetfield was asked what he thought Burton might have felt about the drastic changes in the band's look and sound that the band made through the 1990s and early 2000s with albums like "Load", "Reload" and "St. Anger". Hetfield replied: "Well, I certainly would have thought there would have been some resistance, for sure. I think the 'Black Album' was a great album and I appreciate the fact that we did have the balls to do that… I would certainly think that the 'Load' and 'Reload' [era], I would have had an ally that was very against it all — the reinvention or the U2 version of METALLICA." Following the "Load"/"Reload" albums and tour, METALLICA went into a tailspin that resulted in the exit of bassist Jason Newsted, Hetfield spending the better part of a year in rehab and the band nearly splitting up. METALLICA returned to a heavier style more reminiscent of its early albums on 2008's "Death Magnetic", while its latest disc, "Hardwired... To Self-Destruct", arrived in November 2016. Above photo of Cliff Burton by Harald Oimoen taken from the Bazillion Points photo book "Murder In The Front Row: Shots From The Bay Area Thrash Metal Epicenter", which can be ordered here.